Let your loved ones enjoy and cherish the special days or occasions with some extra special gift from Winni. Celebrate any of the occasion in a wonderful way by presenting this delightful combo. It includes a bouquet of 50 mixed roses along with ferrero rocher and 2 Cadbury dairy milk silk chocolate. The mixed roses are wrapped in red and white paper packing along with ribbon bow. 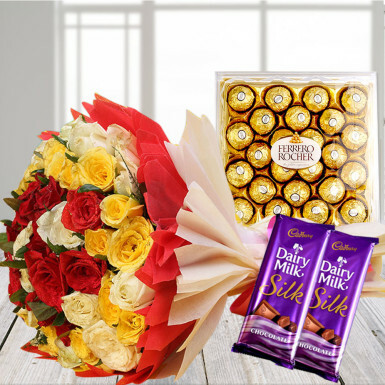 Flower and chocolates make a perfect gift for occasions like birthday, anniversary, mother’s day, valentine’s day, rose day and many more.